The week is approaching its end… and today, on Friday, this subject is even more relevant. 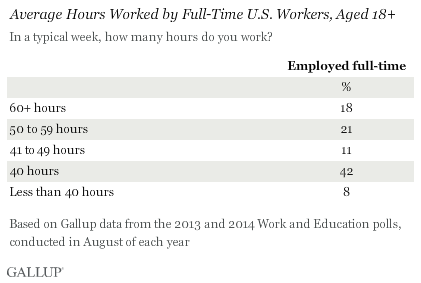 According to Gallup studies, adults employed full time in the U.S. report work an average amount of 47 hours per week, almost a full workday longer than what a standard five-day, 9-to-5 schedule entails. In fact, half of all full-time workers indicate they typically work more than 40 hours, and nearly four out of ten say they work at least 50 hours. Bottom line: it will be interesting to compare the above numbers with some objective measurements of the true number of work hours per week. I think I can guess which numbers will be bigger. This entry was posted in Data Analysis and Visualization, Money, business, investments, statistics, trends and tagged labor statistics in the US, workweek length in the us. Bookmark the permalink.